^ 罗素克劳筹拍导演处女作 《遗落战境》女星加盟. m1905电影网. 2013-10-21. ^ Fleming, Jr, Mike. Russell Crowe Joining Tom Cruise In ‘The Mummy’. Deadline. May 4, 2016. ^ Kit, Borys. 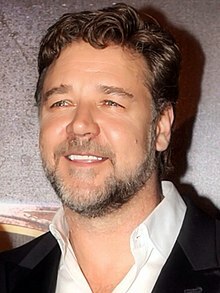 Russell Crowe in Early Talks to Join Tom Cruise in 'The Mummy'. The Hollywood Reporter. May 4, 2016. ^ Kroll, Justin. Russell Crowe in Talks to Join Tom Cruise in ‘The Mummy’ Reboot. Variety. May 4, 2016. ^ 3:10 to Yuma: Christian Bale vs Russell Crowe. Comingsoon.net. 3 September 2007 [10 April 2010]. ^ Sams, Christine. Crowe, Spencer split amid actor's hectic filming schedule. Smh.com.au. [14 October 2012]. ^ Burns, Lindsey. Russell Crowe Has Finalized His Divorce After Five-Year Separation From Wife Danielle Spencer. Closer Weekly. 10 April 2018 [11 April 2018].